Passover and Easter have always had a special relationship. Since Passover lasts for eight days, there is often some overlap between the two spring celebrations. This year, Friday's Seder practically rolls right into Easter Sunday brunch. We keep meeting more and more people who celebrate both holidays, and since almost every Seder features plenty of extra food, we started thinking about ways to repurpose some of those tasty extras. Here, seven ways to brunchify your Seder leftovers. Traditional corned beef hash is a brunch staple. 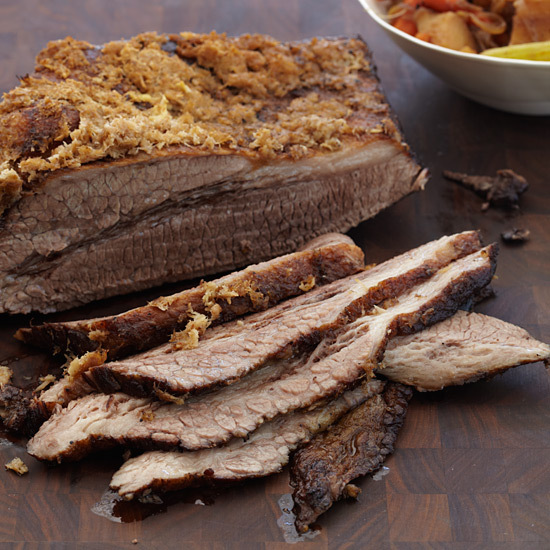 But just chop some of Friday’s brisket, fry it up with onions and potatoes and top with an egg, and you’re ready to go. There is entirely too much matzo floating around during Passover. However, this egg scramble is the best use of the crackers we know of. Unless you want to just cover it in candy. Here’s a wonderful trick we just experimented with: Turn your leftover matzo balls into the base for eggs Benedict. This works best if you have larger matzo balls. Take them out of the soup and let them dry out a little bit. Then slice them into half-inch rounds, heat a bit of oil in a skillet over medium-high and crisp the rounds for about 3 minutes on each side. Top with smoked salmon, a poached egg and a layer of hollandaise (if you want a little more Passover in the dish, add a teaspoon of horseradish to your sauce). Easter brunches generally feature traditional brunch cocktail fare—mimosas, mostly. But this punch will serve everyone easily, and it’s the best (possibly the only) good use for Manischewitz. We know there are people out there who love macarons, but flourless cakes have always been our Seder dessert of choice. And this citrus-almond cake can double back as a Sunday brunch dish. Just take a few slices and dip them in an egg-and-milk mixture, throw them on the griddle. and you’ve got flourless French toast. Haroset is great to eat on its own for days after the Seder is over, but mix it in with a little yogurt, and you can have a whole new dish. Even those who love macaroons will love them even more in the shape of tiny bunnies. Since they are so soft and malleable, just take a few plain coconut ones (not chocolate-covered) and mash them into rabbit molds. Chill them in the fridge to help them better hold their shape.